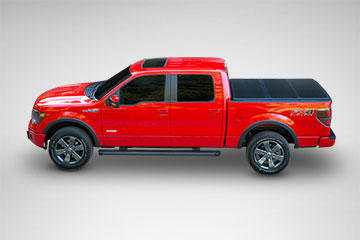 The Leer Trilogy folding tonneau cover makes your truck more functional and versatile than ever before. With Leer Trilogy, you can drive with the cover folded down to secure your truck bed, or you can fold it back and drive with two-thirds of the bed open and accessible. And Trilogy is so easy to install and remove, you can simply put it on or take it off whenever you want. No tools required.